The Belz Hassidic community is threatening a "mass emigration from Israel" if hareidim are forced to join the army. 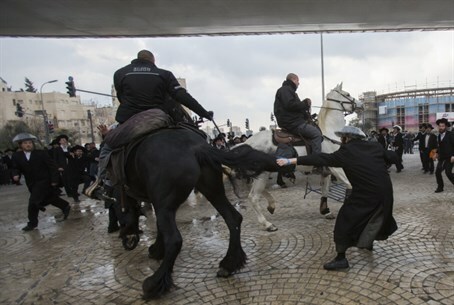 The Belz Hassidic community, one of the largest hareidi communities in Israel, is threatening a mass exodus from Israel should the new draft law pass in the Knesset, the Maariv daily reported on Thursday. According to the report, Thursday’s main headline in the Belz community’s newspaper Hamachane Hacheredi said there were “initial preparations for mass emigration from Israel." The newspaper further claimed that American senators have already promised assistance in obtaining refugee status for every hareidi family that chooses to leave Israel. The paper stated that despite the "pain of abandoning the Holy Land," if a law forcing hareidim to enlist in the army is passed, the "emigration offices will open for registration." A senior member of the Belz community told Maariv that the background to the announcement in the newspaper was a meeting between the Belzer Rebbe and the Satmar Rebbe, who lives in the United States and follows anti-Zionist line, calling on his followers in Israel not to vote in elections, among other things. The Belz community and the Satmar community are related by marriage, being married to sisters. The Belz community insists that the newspaper headline is more than just a statement and is backed by a plan which will go into effect if the draft law is passed, reported Maariv. As discussions conclude in the Shaked Committee, which was charged with preparing the new draft law, hareidi leaders have upped their vocal objection to forcing hareidim to enlist. On Sunday, hareidi leaders will hold a mammoth demonstration that has been called “the million man protest.” The demonstration – prompted by a series of government decisions that are perceived as hurting hareidim – has led to unprecedented unity among all of the hareidi streams. One of the issues of contention in the new draft law has been the issue of criminal penalties for hareidi draft evaders. Nevertheless, the Shaked Committee last week voted in favor of the part of the draft law which stipulates that criminal sanctions will be imposed on hareidim who evade army service. Lapid, as well as Jewish Home Chairman Naftali Bennett who made a pact with Lapid after the last election so they enter the coalition together, have been the target of a campaign by hareidi activists opposed to the new draft law. This week, a mock-up photo of Bennett and Lapid dressed up as Nazi officers was widely distributed on social networks. In the mock-up, the two are seen burning volumes of the Talmud and Torah scrolls. In a second mock-up, yeshiva students are seen wearing concentration camp prisoner uniforms. Police Commissioner Yohanan Danino has ordered that an investigation be started over the incitement attempts against Lapid and Bennett. Also this week, attorney and rabbi Dov Halbertal declared on Galei Yisrael radio that Lapid would be "murdered" by hareidi dissidents over the moves to push for a draft, making comparisons to the 1995 assassination of Prime Minister Yitzchak Rabin. Bennett’s party was actually opposed to criminal sanctions on hareidi draft evaders and called for dialogue with hareidi leaders, but Prime Minister Binyamin Netanyahu ultimately decided in favor of these sanctions, likely due to a fear that Lapid would follow through on his threat and leave the coalition. This caused anger among hareidi MKs, who accused Netanyahu of deception.